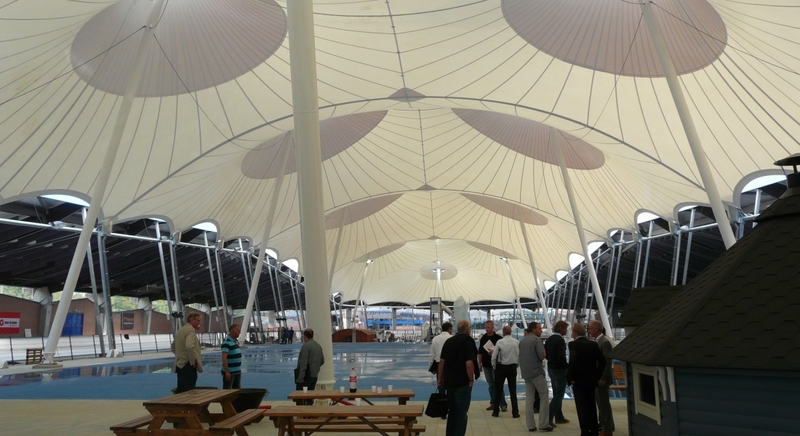 Ice skating track De Scheg underwent a metamorphosis in 2011, after a large tensioned fabric roof was installed, having been only partially covered since its opening in 1993. 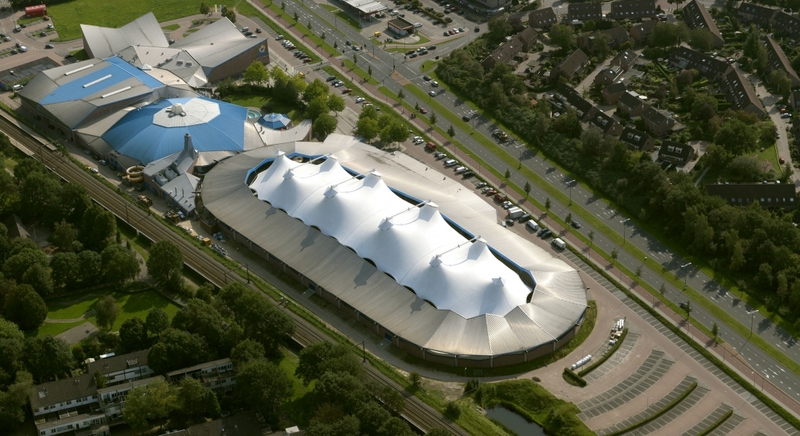 The new roof addition is the largest membrane structure in the Netherlands. Specific challenges were the connections to the existing building and the limited space to position new supports around the central ice hockey rink. 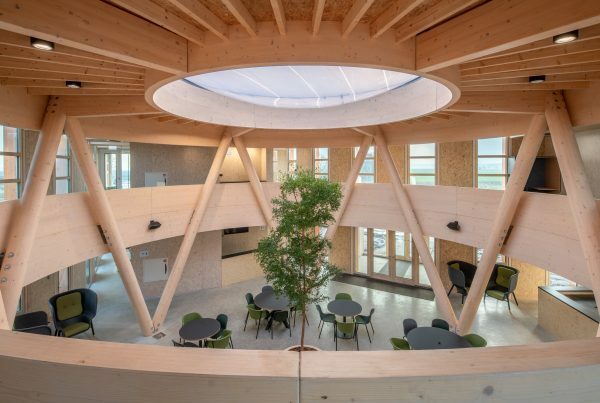 Under previous employment at Witteveen+Bos, Summum Engineering’s Diederik Veenendaal worked on the roof’s feasibility study, structural design and engineering, and checks on the final structural calculations by the contractor. The ice skating track is part of the larger sports complex, De Scheg. To attract more visitors and focus on family and cultural events, a new concept for the complex was devised. As part of this plan the interior of the ice skating track was to be lowered and covered by the new roof. The ice hockey rink underneath was moved to one side, opening up the other side for a new North Pole-themed children’s playground. Meanwhile, the surrounding ice skating track would benefit due to the lower exposure to outside weather and improved interior climate extending the skating season, as well as reducing energy use. Witteveen+Bos provided the project management and engineering for the renovation. 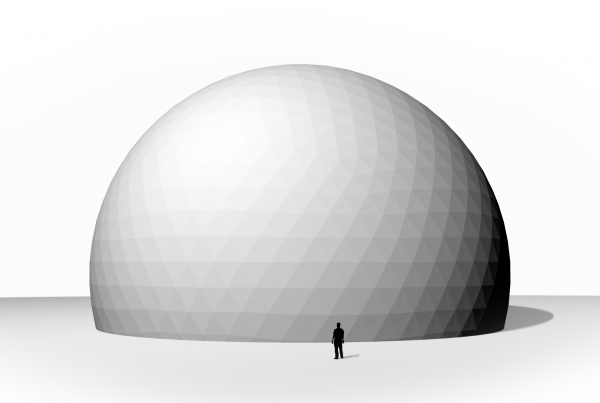 The membrane roof was designed in collaboration with the building’s original architects, Alberts & Van Huut. 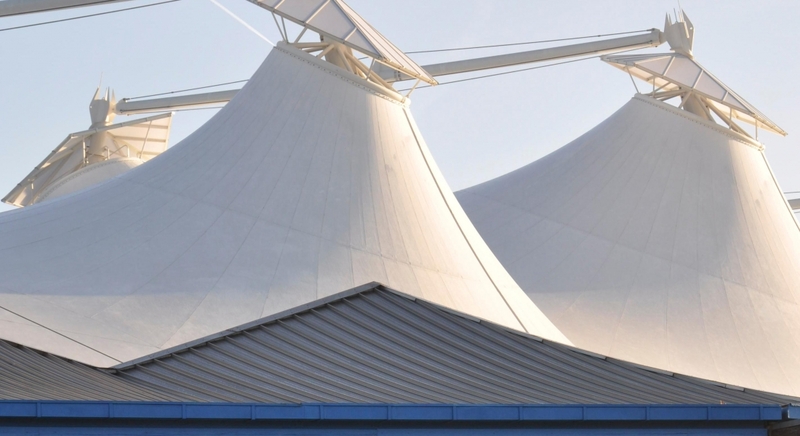 The design of the 5.500 m² roof was driven by multiple disciplines relevant to the project. The existing structure had limits to its load carrying capacity and to the ability to increase it. 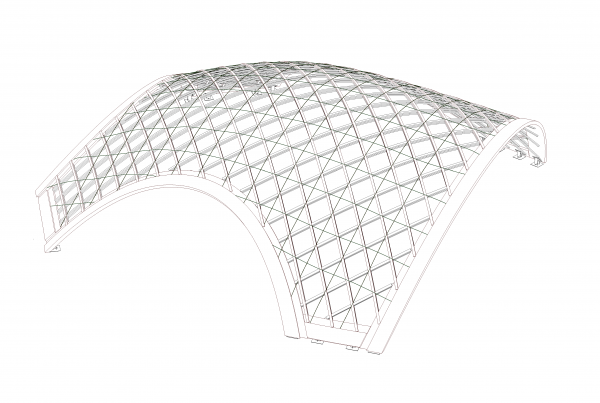 As a result, increasingly refined form finding was needed to find an ideal roof geometry. The final geometry features ten support pylons and three valley cables that distribute forces around the perimeter to the existing steel and concrete columns depending on the specific local capacity. The ice hockey rink and playground below the roof, required that, to allow for enough open space, – unusually – eight of the pylons had to incline inwards, connected in pairs with large struts at the top, above the roof. 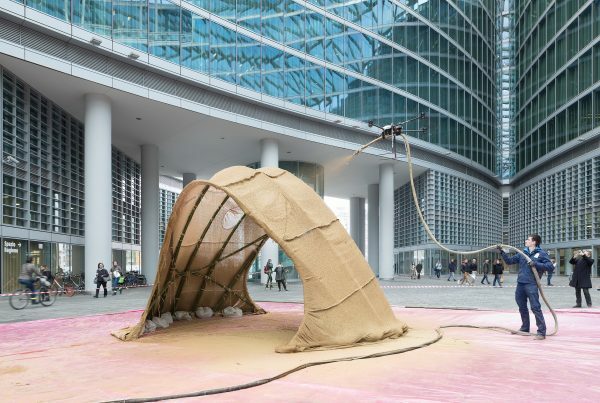 Because building codes do not apply well to complex roof shapes, wind and snow loads were assessed in a wind tunnel instead, using a rigid, 3D-printed scale model. 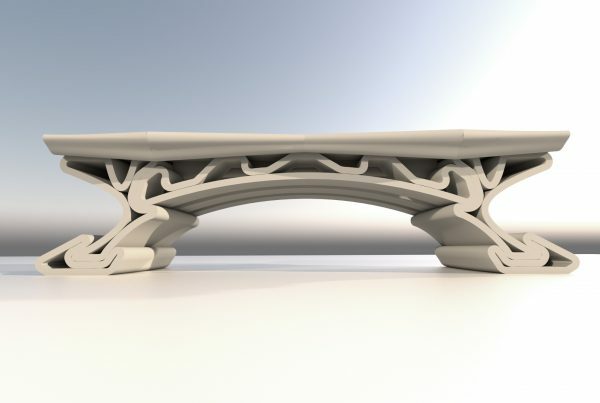 The centralized 3D CAD model that served to generate the scale model, also provided geometry for structural form finding by Witteveen+Bos, room acoustical analysis by Tyrens and CFD fire safety analysis by NIRAS. Openings in the roof were sized to regulate sound transmission and smoke ventilation. Debets, C., 2012. 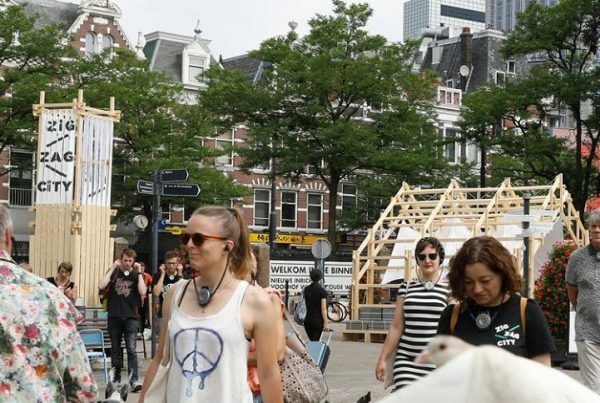 Bijzondere membraanconstructie overkapt ijsbaan De Scheg. Deel 2: De realisatie. Dakenraad. 29-02-2012. Laagland, H., Bos, F. & Dielhoff, T., 2011. Dakmembraan voor overdekte baan, ,Bouwen met Staal, (222), 08-2011, pp. 18-21. Veenendaal, D. , 2010. Grootste membraandak van Nederland. Deel 1: het ontwerp, Dakenraad. Drukke gezellige opening ijsbaan Scheg, De Krijger, J. De Stentor, 08-10-2011. Veel belangstelling vernieuwde ijsbaan Deventer. RTV Oost, 8-10-2011. Dak ijsbaan De Scheg op spanning. De Stentor, 1-08-2011. Membraandoek overkapt kunstijsbaan De Scheg, Van Rijnbach, M. Cobouw, 19-07-2011. Membraanoverspanning pas morgen over ijsbaan, De Krijger, J. De Stentor, 6-07-2011. Verbouwing De Scheg in volle gang. RTV Oost, 17-06-2011. IJsbaan De Scheg krijgt overkapping. RTV Oost, 21-08-2009. Deventer ijsbaan krijgt overkapping. De Stentor, 13-05-2008. Kunstijsbaan De Scheg overdekt. RTV Oost, 13-05-2008. Scheg wil ijsbaan overkappen. RTV Oost, 4-10-2006.